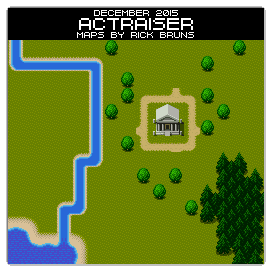 For this month's "Maps Of The Month" featurette, I wish to draw your attention to Rick Bruns's ActRaiser (Super NES) maps. In ActRaiser you play the "Master" of a world populated by humans that worship you, but are repeatedly threatened by demonic forces. Take on human form and vanquish evil! Then return to your home in the sky and foster the growth of your people. Rick Bruns has mapped out all of both modes, so you can see where everything is, whether you are slaying demons or building cities. Equipped with these maps, you can feel as omniscient as you would expect the "Master" of a world would be. 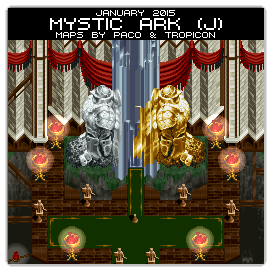 So to recognize the effort put into mapping this world so masterfully, Rick Bruns's ActRaiser (Super NES) maps will be known as VGMaps.com's Maps Of The Month for December 2015. For this month's "Maps Of The Month" featurette, I wish to draw your attention to vorpal86's Tougi-Ou: King Colossus (J) (Genesis) maps. A Japanese fantasy epic that's not on the Super NES but rather on the Sega Genesis? Guess sometimes the Genesis does what Nintendoes too! 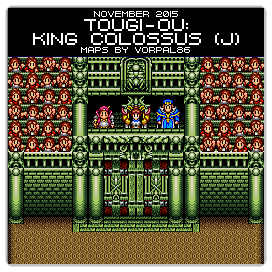 Tougi-Ou: King Colossus (J) was only released in Japan, a shame since the Genesis is not really known for its RPGs. Technically this is an action RPG. While the layouts of the castles (i.e. lots of rooms) will undoubtedly bring The Legend Of Zelda to mind, there are some light RPG elements (i.e. numbers) that might make it more like the Mana/Seiken Densetsu series, if one were to compare. This isn't the first fantasy game on the Genesis to be honoured in 2015, nor is it the first Japanese-only game this year, and it's not vorpal86's first recognition this year either, but why not? You start as a mere fighter training under an old man named Muuk at his cabin, to heroically taking down the big baddies in the huge Danaal Castle. As expected, this quest will take you through a number of dungeonesque areas. Though unlike other games in this genre, there aren't really towns where you can rest up or gather information. You'll be mashing your attack button for most of this game. Some of the later castles get pretty big and so vorpal86's maps will surely be of use. You'll want to avoid the treasure chests that are Man Eater Chests, so even if labelling treasure chests are an expected thing in maps like these, they are particularly helpful here if you don't want a nasty surprise. So to recognize the effort put into mapping another Genesis epic, vorpal86's Tougi-Ou: King Colossus (J) (Genesis) maps will be known as VGMaps.com's Maps Of The Month for November 2015. For this month's "Maps Of The Month" featurette, I wish to draw your attention to Revned's Castlevania: Symphony Of The Night (PSX) maps. Castlevania: Symphony Of The Night is the first of a number of "Castleroid"/"Metroidvania" games within the Castlevania series, and the only one originally for consoles. It is also a direct sequel to the PC Engine game Castlevania: Rondo Of Blood, where the ending serves as this game's prologue. But most of all, Castlevania: Symphony Of The Night is often regarded as the best Castlevania game ever. If there's still even any question about that, it is undisputedly the largest. Longtime VGMaps contributor Revned knew that mapping Symphony Of The Night would be an incredible challenge. Even one castle is certainly massive in size, but there were many obstacles besides the enormity of it all. Apparently the PlayStation hardware is built more for 3D than for 2D, and there are various layers and transparencies to contend with, technical obstacles like that. Though he started this off as a multi-mapper project, receiving help from Edsword, mephea, TerraEsperZ, Wileee and Zeric, Revned soon fully took the reins and completed the first castle after three years. After a few more years, he surprised everyone with maps of the second castle that'd he'd been quietly working on by himself! As if that wasn't enough, he also put together maps of the exclusive areas in the Sega Saturn version. The individual area maps look great, but if your device and browser can handle it, viewing the fully-assembled castles - or the massive 36 megabyte image of both castles together - well, nothing beats that! 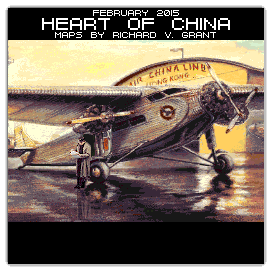 He finished all of this by Hallowe'en of last year, so for this "Maps Of The Month" recognition to come almost a year later, it feels overdue, but it also feels only appropriate for it to be in this month and no other. 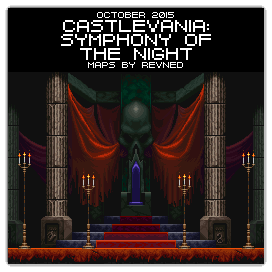 So to recognize the effort put into mapping the biggest and best Castlevania game of all time, Revned's Castlevania: Symphony Of The Night (PSX) maps will be known as VGMaps.com's Maps Of The Month for October 2015. For this month's "Maps Of The Month" featurette, I wish to draw your attention to FlyingArmor's Dragon Quest I & II (Super NES) maps. There's a trend in remastering and/or making compilations of games from a previous generation. This isn't just a recent thing, nor was Super Mario All-Stars the only one that took the 8-to-16-bit leap. In Japan, the first two Dragon Quest games were rereleased together with upgraded visuals on the Super Famicom. The first Dragon Quest is credited for establishing the JRPG genre as we know it. 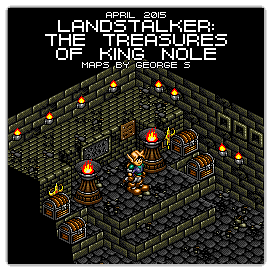 The second game is a worthy sequel that expands the world and deepens the story of the Erdrick Saga. At times, in Japan the Dragon Quest series has been more popular than even Final Fantasy, so this bundle of the first two games is certainly worthy of a remake, and good for anyone who missed them the first time around. Later, there would even be a Game Boy Color rerelease that makes its way to North America, so Enix clearly wants everyone to remember console JRPGs' roots. It's always quite an undertaking to map a whole RPG, but FlyingArmor has mapped two here. Marking maps with the contents of treasure chests, indicating hidden items, and showing how stairs and teleporters connect may be unsurprising additions to maps at this point, and practically expected for a Maps Of The Month honouree, but of course are always appreciated. You'll never get lost in Alefgard (and the rest of the world) thanks to FlyingArmor! 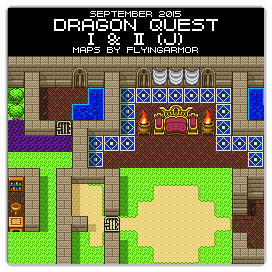 So to recognize the effort put into dual-wielding these classics, FlyingArmor's Dragon Quest I & II (Super NES) maps will be known as VGMaps.com's Maps Of The Month for September 2015. For this month's "Maps Of The Month" featurette, I wish to draw your attention to Shiny's Quest RPG: Brian's Journey (GBC) maps. In Quest 64, Brian's father goes in search of a mysterious book, but goes missing. So Brian sets off on a quest to find the book, and his father, and as luck would have it, gather some crystals and save the world. What's that? We're not talking about Quest 64? Oh, Quest RPG: Brian's Journey? Well, it's the same story, but in glorious handheld 2D. Remaking console games for handhelds is a practice done since the original Game Boy. It might be a matter of cutting out a few things and/or adjusting the resolution and HUD, but it's pretty much the same gameplay experience. But a unique example of the porting process is Quest 64, a polygonal game on the Nintendo 64, shrunk down to a overhead-perspective two-dimensional game on the Game Boy Color. Really, it's not a conversion, but a total rebuild on a different engine, though it uses the same story. From Melrode to the World Of Mammon, Shiny has mapped everything twice, for those of us who like to see everything with or without labels. Dedication! 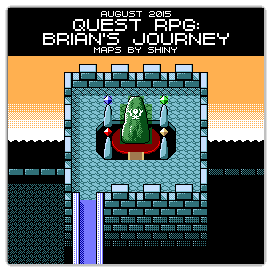 So to recognize the effort put into doing a re-Quest, Shiny's Quest RPG: Brian's Journey (GBC) maps will be known as VGMaps.com's Maps Of The Month for August 2015. For this month's "Maps Of The Month" featurette, I wish to draw your attention to Gennadiy_Master's RoboCop Versus The Terminator (Genesis) maps. Based on the 1992 Dark Horse Comics' crossover mini-series of the same name, in RoboCop Versus The Terminator, Alex Murphy takes on Skynet (as you would expect from the title). RoboCop starts fighting through modern-day Detroit, and though digitized into SKynet, he is eventually able to rebuild his body and resumes the battle against the Terminators to fight to save mankind in the future. The game appears on both the Super NES and the Sega Genesis, and are both platformers, but have quite a number of differences. Electronic Gaming Monthly considered the Genesis game to be the "Bloodiest Game of 1993", and we are looking at Gennadiy_Master's maps of it here. It's been mapped twice - once with enemies and once without, giving us a double dose of this double-cyborg crossover. Though this is his first recognition here, Gennadiy_Master has contributed a number of maps to VGMaps.com, so you could say that mapping games is one of his prime directives, and there's a pretty good chance that he'll "be back". 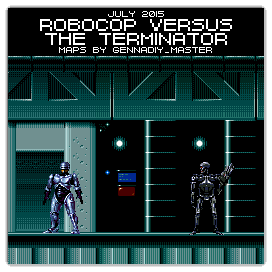 So to recognize the effort put into mapping this game for the Genisys...er, Genesis, and twice over, Gennadiy_Master's RoboCop Versus The Terminator (Genesis) maps will be known as VGMaps.com's Maps Of The Month for July 2015. For this month's "Maps Of The Month" featurette, I wish to draw your attention to vorpal86's Lagrange Point (J) (NES) maps. Lagrangian points, in astronomy and physics, refer to five positions in an orbital configuration of and around two large bodies (like a planet and the star it orbits, or a moon and the planet it orbits) where an object can keep positionally stable relative to the two larger bodies by their gravity. Lagrange Point (J), in video gameography, refers to a space-themed JRPG by Konami from 1991. In it, you will lead a research team to investigate a biohazard outbreak on Land-2 of the Isis Cluster of space colonies. Batlle monsters in random encounters, explore large worlds, save the day, and all that fun stuff you expect to do in most RPGs...but in space! vorpal86 has mapped this RPG like any other should...thoroughly. Area names, doors and items marked! Enemy info! Shop lists! Other vital information too! While here on VGMaps.com that may almost be the expectation of some of the more popular RPGs (not that it's any less appreciated, mind you), it's especially nice to see the effort but on more obscure, Japan-only releases. 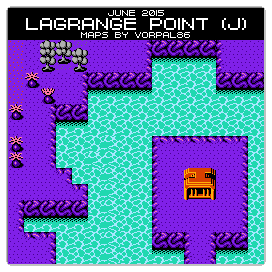 So to recognize the effort put into making a point to inform us all of this neat game, vorpal86's Lagrange Point (J) (NES) maps will be known as VGMaps.com's Maps Of The Month for June 2015. For this month's "Maps Of The Month" featurette, I wish to draw your attention to Will Mallia's Captain America And The Avengers (NES) maps. When Iron Man and Vision are taken down, it's up to Captain America and Hawkeye to save the day in this NES platformer. With intel from Wasp, you will make your way across the United States, and face supervillains including Crossbones, the Wizard, and Ultron. Can the Avengers make their way to the Colony and save the world from the evil Red Skull? Captain America And The Avengers on the NES is a platforming game from Data East, with a somewhat non-linear progression, unlike the beat-'em-ups on the Super NES and the arcade games of the same name. While some individual stages are pretty straightforward, there are also a number of warehouse-like areas that are a bit more tricky. In any case, Will Mallia's got you covered. If there were ever an Ironman competition for mapping, Will Mallia's hawk-eye vision would leave everyone seeing red...or scarlet. Which is to say, he's very thorough and quick. Silver medal? No way, the hulking mass of maps Will Mallia has made puts him on top in terms of numbers, despite everyone's fury. If not for just this Captain America game, let's at least recognize Will Mallia's many contributions, what a wizard! With mapping, he's quite adamant, man! 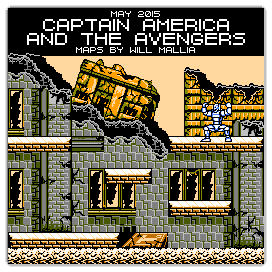 So to recognize the effort put into mapping with a vengeance, Will Mallia's Captain America And The Avengers (NES) maps will be known as VGMaps.com's Maps Of The Month for May 2015. For this month's "Maps Of The Month" featurette, I wish to draw your attention to zagato blackfist's Super Ninja Boy (Super NES) maps. Jack and Ryu are out to save Chinaland (again). And to do so, they'll have to recover the seven Auraballs! Super Ninja Boy is the North American version of Super Chinese Land (J), a game in the "Super Chinese" series, of which most of the series has not been seen in the West. They do have a big fan, though, zagato blackfist, who has mapped a number of these games for us here on VGMaps.com. It's not too uncommon to see games having regional differences. Besides language, obviously, there are other localization choices made to appeal to cultural standards. Perhaps religious symbols are censored out or modified, or food items are changed into something resembling more common cuisine in that part of the world. But Super Ninja Boy has a number of changes which seem rather superfluous. Compare the World map, for instance, and you can see that some interesting looking towns and castles look a bit more generic in the North American release. The overall landmass is similar, but here and there you will find a number of alterations that serve no real purpose. The Underwater area has a lot less detail and fewer sunken ships. Perhaps it's not necessarily a cultural thing but that someone just felt like changing the graphics and layout of the game without disrupting the overall experience. Nothing major, just random tweaks on a whim. Whatever the case, zagato blackfist has mapped both versions for us, so we can enjoy comparing them, even if we don't quite understand why the changes exist. He's essentially mapped the whole game, twice! 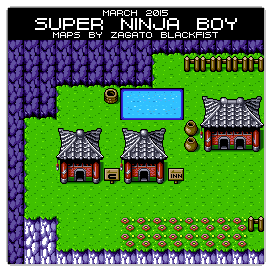 So to recognize the effort and dedication in mapping a game 200%, zagato blackfist's Super Ninja Boy (Super NES) maps will be known as VGMaps.com's Maps Of The Month for March 2015. Congratulations and thanks to the Mapmakers of 2015!